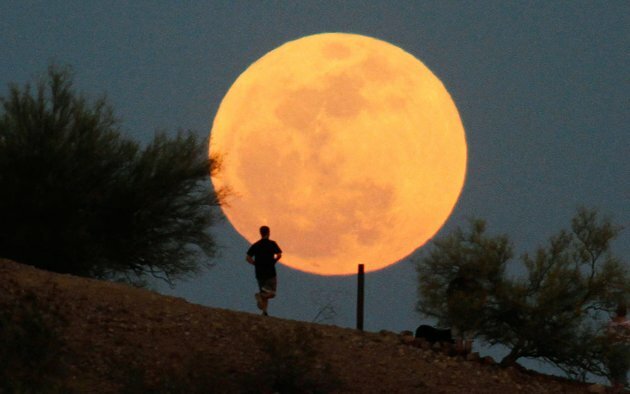 I like the term ‘super moon’ – it suggests that the moon can be even better than it typically is. It is more than a catalyst for hundreds of songs, more than the provider of the perfect aerial glow under which millions of first kisses take on magical qualities and so much more than the man who lives there. It’s a Super Moon. It can do anything. I stared at it last night for a long time, marveling at the larger space it assumed in the night sky. It defiantly shone through the clouds that tried to minimize its impressiveness; the clouds didn’t have a chance. I made a wish – after all, if one wishes on the first star in the night sky, isn’t is possible that when the moon is feeling super, it may be equally accommodating? I figured it couldn’t hurt. I hedged my bets though – I kept my star wish, my silently spoken prayers and if I walked around with salt, I would have thrown some over my shoulder for good measure. None of that diminished my awe at the magnified brilliance of the moon – it reflected its light insistently and I for one couldn’t argue the point. It was the Super-est of Moons. Posted on May 6, 2012 by mimijk •	This entry was posted in humor, inspiration, life lessons, mindfulness and tagged Full moon, Supermoon. Bookmark the permalink. Thanks so much! I love the pictures on your post! !